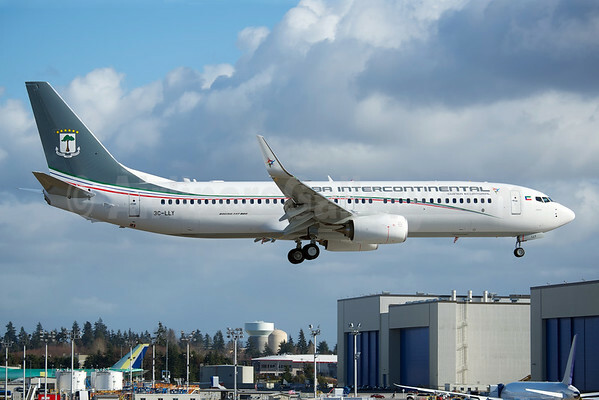 Equatorial Guinea has resumed regional flights to neighboring African countries by its national air carrier, Ceiba Intercontinental, after taking control measures to safeguard public health. The temporary suspension of the Ceiba Intercontinental flights was a precautionary measure adopted by the government, but it resumed the flights after it obtained equipment to detect and confront a possible Ebola outbreak. The flights were resumed in order to break the isolation of the affected neighboring countries, which need commercial air service in order to receive supplies and maintain commercial ties with the rest of the continent. Copyright Photo: Bernie Leighton/AirlinersGallery.com. Boeing 737-8FB 3C-LLY (msn 41157) arrives at Paine Field on a test flight before its delivery. This entry was posted in Ceiba Intercontinental and tagged 3C-LLY, 41157, 737, 737-800, 737-8FB, Boeing, Boeing 737, Boeing 737-800, Ceiba Intercontinental, Ceiba Intercontinental Airlines, Ebola outbreak, Ebola virus, Equatorial Guinea, Malabo, PAE, Paine Field on September 23, 2014 by Bruce Drum.